A cleanroom is a facility that is designed for the purposes of certain fields of research such as biological or chemical research, and also for the manufacturing of certain products. 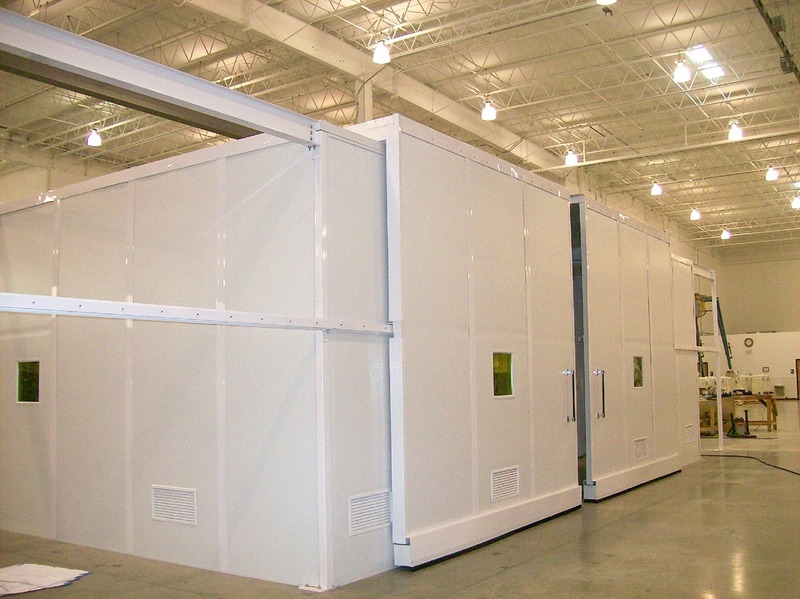 Panel Built sells pre-fabricated non-metallic cleanrooms. These purposes tend to involve environmentally sensitive processes that require a sterile and uncontaminated environment. These processes are conducted with certain procedures that are intended to prevent the contamination of the environment such as with airborne particles and bacteria, procedures that range from a strict employee dress code, washing, isolated lockers and chambers, air showers, and thorough cleaning. The design of the clean room itself employs HEPA and ULPA filters to facilitate an air flow through the facility that keeps out contaminants, generally with a positive pressure flow to push contaminants out, or a negative pressu re system that keeps everything in, depending on the requirements. Panel Built offers up to a Class 1,000 clean room, and as always, our highly qualified staff is readily available to assist you in every step of your purchase, from design to installation. There is no better choice for a turn-key modular cleanroom system than Panel Built, Inc.
Every cleanroom is unique so Panel Built offers a variety of wall systems and air systems to meet your desired specifications. Panel Built offers up to a Class 1,000 clean room, and as always, our highly qualified staff is readily available to assist you in every step of your purchase, from design to installation. There is no better choice for a turn-key modular cleanroom system than Panel Built, Inc.
Panel Built has a variety wall systems for modular cleanrooms available online, which are easy to purchase, of high quality, and cost effective. We have a cheap available ISO 6 cleanroom for sale, or if you need to know where to buy a cheap ISO 7 cleanroom online, you’ve come to the right place. There are few companies that sell pre-fabricated non-metallic cleanrooms, and you’ll be hard pressed to find one with a reputation such as ours. What Else Can Panel Built Do For You? Heavy duty industrial platforms are excellent for supervisory in-plant offices, metal range towers, vision towers and more—Mezzanine-Built mezzanine systems from Panel Built, Inc. provide a clear view of plant work areas and convert wasted vertical space into productive work environments. Safety guards and barrier rails are constructed of high strength steel and designed to withstand severe impacts. This railing system can be ordered in single or double rails. A powder-coated finish enhances the steel surface.